This presentation discusses BluWave-ai’s findings on applying machine learning techniques for time series prediction in smart grids. 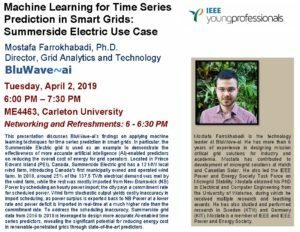 In particular, the Summerside Electric grid is used as an example to demonstrate the effectiveness of more accurate artificial intelligence (AI)-enabled predictors on reducing the overall cost of energy for grid operators. Located in Prince Edward Island (PEI), Canada, Summerside Electric grid has a 12 MW local wind farm, introducing Canada’s first municipally owned and operated wind farm. In 2018, around 25% of the 137.5 TWh electrical demand was met by the wind farm, while the rest was mostly imported from New Brunswick (NB) Power by scheduling an hourly power import; the city pays a commitment rate for scheduled power. Wind farm stochastic output yields costly inaccuracy in import scheduling, as power surplus is exported back to NB Power at a lower rate and power deficit is imported in real-time at a much higher rate than the commitment rate. To address the scheduling inaccuracy, Summerside grid data from 2016 to 2018 is leveraged to design more accurate AI-enabled time series predictors, revealing the significant potential for reducing energy cost in renewable-penetrated grids through state-of-the-art predictors.